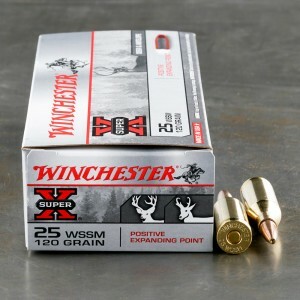 25 WSSM ammo is also known as the 25 Winchester super short magnum. The cartridge is a member of the Winchester super short magnum line. The round was designed in 2004 as a combination effort between both Winchester and Browning. The 25 WSSM uses the 300 WSM case as its parent case, necked down to accept a 25 caliber projectile. The super short magnum concept is to deliver magnum performance in a short action rifle. The cases are often described as short and fat. That extra width is what improves case capacity, allowing for magnum like performance in a shorter round. The 25 WSSM is an excellent hunting round and can take most North American game. This includes large deer species, and even large feral hogs across the southwest. 25 WSSM ammo projectiles typically range from 75 grain up to 120 grain and they can reach velocities 3,700 feet per second 2,900 feet per second, respectively. Really hard to come by this ammo now. Was happy to find it here plus customer service was great.